Above is a lovely full body stretch that i like to give our clients and they absolutely love it. They all get up feeling great after spending a little time performing it. Some learn to do it at home too. Get a pillow to rest your head on. Go into the first aid recovery position. Think opposite hand opposite leg when getting into position. When you have hold of the legs, slowly start trying to turn your chest up to the ceiling. Look towards the upper shoulder. Ensure you move slowly, ensure there is no pain, only mild stretch. Be patient over time. Use your breath and relax into the stretch. Try to hold 1-2 minutes. Come out of the position slowly then repeat on the opposite side. 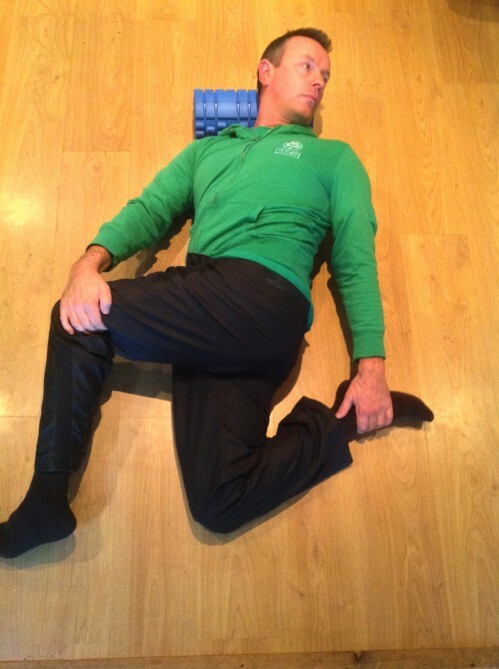 You will stretch many muscle groups with The Pretzel stretch. Outer hip, quads, hip flexors, spinal rotators, chest and neck rotators to name a few.